London’s Daily Mail has a fascinating story about Stephen Wiltshire, an artist diagnosed with autism. Often considered a disability, Wiltshire creates enormous sketches of famous skylines. Entirely from memory. In amazing detail. After marveling at the best of humanity, the worst of humanity is an interesting read, too. In Italy, a Mafia execution in broad daylight was caught on camera in May. The police have released the video in the hopes that someone might drop the dime on who the shooter was. The killing, while chilling*, looks effortless and smooth. The article includes a quote from “Walter Veltroni, who is now a member of the Anti-Mafia Commission.” Something tells me that Mr. Veltroni always sleeps with one eye open. * Sorry, I wasn’t going for a rhyme there, but I can’t change it now. However, I recently began thinking about moving to the Netherlands again. This time, it has nothing to do with Republicans, Glenn Beck, the economy, or anything of the sort. It has to do with stroopwafels. I bought some at Trader Joe’s. They’re soft crackers (not a very accurate description) filled with caramel. That’s not a great description either. Wikipedia does a better job. But really, you have to eat them to fully appreciate them. And then, when you read the Wikipedia page about huge stroopwafels, made with cinnamon, served hot, freshly made, on the streets of Amsterdam, you, too, are going to start looking at emigrating to the Netherlands. So what don’t I care about? Furthermore, if a close friend of mine were to tell me that they had given their dog back to its breeder because they didn’t have time to care for the dog, I would say, “Oh, I see,” and promptly forget about it, because I wouldn’t care. Seriously, how are any of those any different from Kate Gosselin and her dogs? If you ever, for some reason, need to find a day that is guaranteed to have poor weather, I’ve found a neat trick. Plan your event on the day that NASA is launching something. It may only be something like high winds, but you’re pretty much guaranteed that the weather will be bad enough to delay the launch due to weather. In other words, a law exists specifically to preclude people from just hanging out in the left lane on highways. Sadly, it carries only a $100 fine, not mandatory imprisonment. Today, I will be the loser who blogs about gardening. One day this summer, I found a package of corn seed and decided to plant it. Since I’d had bad luck germinating things in the past, I put dozens of seeds in the ground. Most, if not all, of them ended up growing. Since I’ve never grown corn before, and since I only planted corn after happening across it in the garage one day, I ended up planting it far too late in the season. While the corn grew quickly, it was planted late enough that it never got more than about four feet tall. I left it as long as I could, but after a few frosts, I picked it today. The plants had yellowed. I ended up picking about 20 ears of corn. 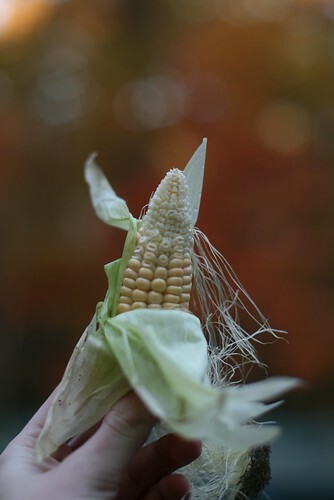 They were all a lot smaller than they should have been, perhaps 6″ long, and as the photo shows, the corn hasn’t grown in fully. I’m not sure what to do with the corn at this point, but it’s sitting in a bucket. I’m thinking I could let it dry and try to plant it next year. I still have half the bag of seeds, so I could end up growing a considerable amount of corn. A bit of advice I read on planting corn was to space the plants with at least a foot between each plant. I had eight seeds planted in the same hole. The roots seem to have intermingled, leaving one big clump of plants. The few individual plants didn’t grow any taller or produce bigger ears of corn, so I’m not sure that planting corn more densely than recommended is really such a bad idea. Earlier this year I cut off all the shoots from our lilacs. There must have been at least 50, each just a few inches. When the cold weather was closing in, I planted the cut-off shoots/root sections in the ground, figuring that the pots would freeze. Somewhat to my surprise, the plants are still green. If they make it through the winter, there are going to be far too many plants. Somewhat curiously, when I initially cut the shoots off of the roots and transplanted them, all of the leaves fell off. But before I could conclude that they were dead and dump them, new leaves started to grow in, and today, the plants seem to be growing. I’ve posted my review of the Pro96, Radio Shack’s digital police scanner. A high-level overview is that it has lots of features but is so shoddily built that I really wish I hadn’t wasted my money. After disassembling it for the millionth time trying to fix the problem with volume cutting out, I had another one of my revelations: I’m sick of this crap. In past discussions about police scanners, I’ve also vented that there doesn’t seem to be much innovation. They keep releasing new models that don’t really bring any features. Then I discovered Uniden’s BCD396XT. One of the first things I noticed is that there isn’t a slew of complaints on the Internet about the volume knob not working, or no sound coming out the speaker. It’s also smaller and more compact, as if Uniden actually employs people who use police scanners and realized that a big, clunky, yet hollow enclosure was really annoying. I’m also running into a problem with the Pro96 where, although it has 500 channels, it has ten banks of 50 channels, each of which can only (as best as I can tell) contain a single trunking system. So even though I don’t really listen to all that much, my scanner is pretty much full, because I use the banks to organize logical groups of channels. And then I realized — Uniden not only employs people who own scanners, but people who innovate and come up with new features. They implemented Nuisance Delete but called it Temporary Lockout. It can decode NACs, and the tones fire departments use when “toning out” calls. It can even do Priority mode on a trunked system, so that when the police key up on a trunked system, your scanner will drop the chit-chat on the DPW channel and go back to the police. You can program a channel as digital-only, so that when your piece-of-junk scanner stops decoding the signal, it won’t play the digital audio, un-decoded, through the speaker. (But maybe this new scanner doesn’t even have the problem the Pro96 did!) It includes AGC, which the Pro96 claims to have included, so that really loud transmissions are quieted and really quiet transmissions are pulled up a bit. It shows signal strength and battery level. In short, it’s basically everything I’ve ever wanted, sans a really clear menu system. The only problem is that it’s $495. And I’m not sure anyone would want to buy my current police scanner, which I don’t think I could honestly sell without mentioning that it’s a giant piece of crap that I’m trying to unload because I hate it so much. I now know what I want to be for Halloween. And it’s safe: “It has the same chance of lifting your 6-year-old as the one you may have seen on CNN or MSNBC TV.” I just found out where they’re sold online. Of course, the costume won’t be complete unless I also carry around a Tupperware container into which I vomit profusely. I think I’ve mentioned before that I view gay marriage as a “duh” right. Anyone arguing against it is a bigot trying to deny a civil right to a minority solely because they don’t like that minority. I can’t fathom how anyone could view it as anything but that. The woman at my polling place asked me: do I believe in equality for gay and lesbian people? I was pretty surprised to be asked a question like that. It made no sense to me. Finally I asked her: what do you think I fought for in Omaha Beach?